Here we have another beautiful oil painting by the very talented Ukrainian artist Oleg Shuplyak. In this picture he has painted a country scene of a little boy sitting beside some lambs in a field with some cottages in the background. It all looks very peaceful and relaxing. 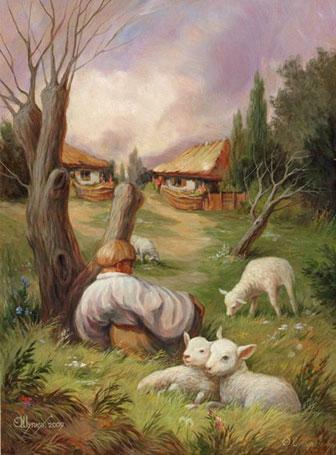 As with all his artwork Oleg Shuplyak uses hidden images to produce amazing optical illusions and this painting is no exception. If you look closely at this masterpiece you can see it also depicts the face of a man with a white moustache.